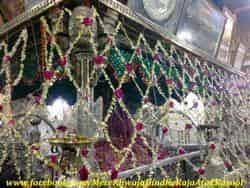 Hazrat Khwaja Moinuddin Hasan Chishti (Rehmatullah Alaih) popularly known as Khwaja Gharib Nawaz (Rehmatullah Alaih), "The founder of Chishti Order of Sufis" in India was born in 1142 A.D. in Sijistan (Iran). His paternal genealogy is related to Hazrat Imam Hussain (Radiallahu Ta'ala Anhu) and that of his maternal to Hazrat Imam Hassan (Radiallahu Ta'ala Anhu) and thus he is a direct descendant of Prophet Hazrat Muhammad (Sallallahu Ta'ala Alaihi Wasallam). His father, Sayyid Ghiyas-u’d-din, a pious man of some means, died when his son was in his teens. He left as legacy an orchard and a grinding mill. Once Hazrat Khwaja Moinuddin Hassan Chishty (Rehmatullah Alaih) was looking after the plants in his garden that a mystic, Shaikh Ibrahim Qanduzi, happened to pass by. Shaikh Mu’in-u’d-din entertained him in his garden. Hagiologists trace the germination of mystic attitude in him to the blessings of this Saint. In fact, the most powerful factor in giving a mystic touch to his personality at this early stage was the condition of Sijistan which had suffered terribly at the hands of the Qara Khita and the Ghuzz Turks. It drove the Khwaja’s mind inwards and he realized the futility of hankering after worldly glory or looking after worldly goods. He sold all his assets, gave the proceeds in charity and took to itineracy. He visited the eminent scholars of his age. While on his way to Iraq, he passed through Harvan, in the district of Naishapur. Here he met Khwaja ‘Ushman Harooni’ and was so deeply impressed by his spiritual eminence that he decided to join the circle of his disciples. For twenty years he accompanied him on his arduous mystic journeys and performed all sorts of personal services to him. Shaikh Mu’in’d-din once told his disciples. “I did not give myself a moment’s rest from the service of my Peer-o-Murshid, and carried about his night clothes during his journeys and stoppages”. Na Qisan Ra Peer-e-Kamil, Kamilan Ra Peshwa"
Garib Nawaz Rehmatullah Alaih loved humanity in general and the Indians in particular. Indeed he had a mission to bring a social and spiritual revolution. Perhaps in no other country were the effects of this social and cultural revolution so marked and so far reaching as in India. Sufism (Islamic mysticism) reached India when it had entered the last and the most important phase of its history the organisation of Sufistic structure of Islam having various denominations, especially Chishtiya, Qadriya, Naqshbandia, and Suharwardia. Among these denominations the Chishtiya order has been supremely successful on all levels of pluralistic society of India based on cultural, religious, and social differences. The word Urs has been derived from “UROOS” which means “ultimate meeting of an individual with God” it is said that Huzoor Gharib Nawaz (Rehmatullah Alaih) spent last six days of his life in Seclusion in a cell and the 6th day of Rajab, his noble soul left the corporeal body. Every year Urs Mubarak is celebrated on his death anniversary in the Islamic month of Rajab. Just before the Qu'l (conclusion of 6th Rajab Chhati Sharif) Bhadawa is sung at the main entrance of the Shrine by Qwwals which literally means a poem or verses in praise of Allah, His Holy Prophet (S.A.W.) or famous Sufis (Auliyas). Badahwa is the only recitation which is accompanied by talis (clapping) only, and no other instrument is played. 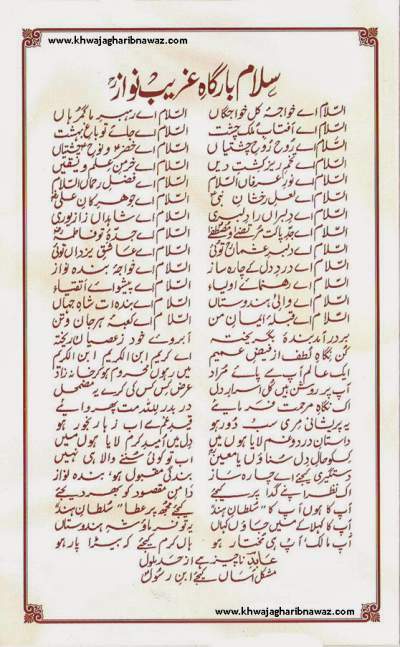 It was composed by Hazrat Syed Behlol Chishty, one of the ancestor of Khadims who again refers to Khwaja Moinuddin Chishty (Rehmatullah Alaih) as Khwaja Hasan Dan. After its recitation, the ceremony of the Qul comes to an end and Fatiha is recited. The ceremony is marked closed by firing a cannon at 1:30 P.M. in afternoon. When Khwaja Sahib had acquired the best knowledge and wisdom of the time, he travelled widely in search of a Pir (spiritual guide) who could provide him with the best spiritual guidance. He came to know of Hazrat Khwaja Usman Harooni Rehmatullah Alaih who was the greatest scholar and unrivalled spiritual guide of that period. In the very first meeting, Khwaja Sahib completely submitted himself to his Murshid and remained in the company of this great divine spiritual leader, for twenty years and served him devotedly, passing through the various stages of spiritual life. Thus the great Murshid trained and elevated Khwaja Sahib to the highest spiritual attainments. Khwaja Muinuddin Chishti Rehmatullah Alaih arrived in Ajmer at the age of 52 years around 587 A.H. (1190 A.D.), on his divine mission, unique in the annals of Islam. His only armour for the success of his great mission was the greatest “invisible power” that pervades and sustains the whole universe. At that time, Ajmer was ruled by Prithvi Raj Chauhan, the famous Rajput king. In his court, he had a large number of powerful magicians with Ajai Pal as their leader. Khwaja Sahib stayed on a hill close to Ana Sagar lake now known as the Chillah Khwaja Sahib. When the news spread that a very pious Dervish had come to Ajmer, people began to flock to him in increasing numbers. Whoever came to him, received the kindest treatment and blessings. People were so much inspired by his divine teachings and simplicity that they began to embrace Islam. Many became his disciples. Even Ajai pal submitted himself to the divine powers of Khwaja Sahib, gave up all his magic and became his disciple. After achieving the objectives of his mission and complying with the command given to him by the Holy Prophet (Sallallahu Ta'ala Alaihi Wasallam), his noble soul left the mortal body on the 6th of Rajab 633 A.H. (March 16, 1236) at the age of 97. He was buried in the same cell which was the centre for his divine activities, throughout his stay at Ajmer. Today his tomb is popularly known as The Dargah Sharif (holy tomb). People of all walks of life and faith from all over the world, irrespective of their caste, creed and belief, visit this great shrine to offer the flowers of their esteem and devotion. The rich and the poor stand side by side to pay homage and respect to this divine soul. Khwaja Muinuddin Chishti Rehmatullah Alaih followed this dictum strictly throughout his mission. It is because of this that he became popularly known as Gharib Nawaz, which means ‘the one who shows kindness to the poor’. This was later reinforced by succeeding Chishti Sufis, who became religious pioneers in national integration in the country. They fulfilled the objectives of bringing together the various castes, communities and races, elevating humanity from the swamp of materialistic concerns, which is leading mankind to destruction even today. 1. A friend of God must have affection like the sun. When the sun rises, it is beneficial to all. All persons derive heat and light from it irrespective of whether they are Muslim, Christian, Sikh, Hindu, etc. 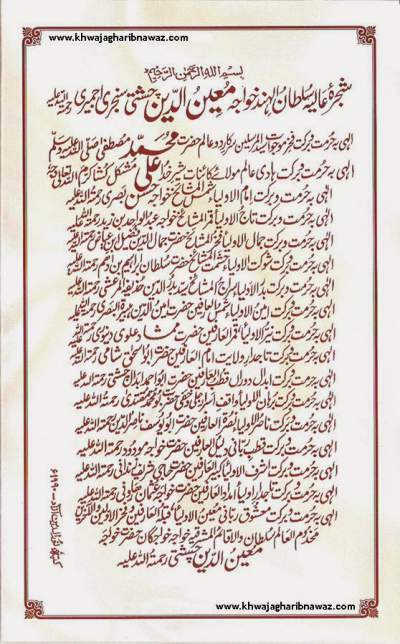 Sacred Sayings of Khwaja Moinuddin Chishti Rehmatullah Alaih..
1. Without performing Namaz (prayer), none can approach Allah (God), because Namaz is the climax (mi’raj) in the process of such an approach for the pious. 3. The heart of a lover (True lover of Allah) constantly burns with the fire of love, so much so that whatever intrudes upon its sanctity is burnt to ashes. 4. A sin committed does not harm an individual so much as looking down upon one’s own fellow human beings. 5. Of all the worship that pleases Almighty Allah, the most is the granting of relief to the humble and the oppressed. 6. Performance of charity is the key of attaining the estate of a philanthropist. 7. The one who does not perform devotion of Allah is engaged in the career of earning a sinful living. 8. There are four cardinal virtues of the individual self: (i) refraining from begging in the state of penury; (ii) showing the attitude of being well-fed when feeling hungry; (iii) maintaining a cheerfulness in the time of sorrow; and (iv) befriending the enemy. 9. That man is a true devotee of Almighty Allah, who resigns with pleasure to the misfortune that comes from his beloved (Almighty Allah). 10. The path of Love of God is such a path that whosoever steps into it, loses himself. 11. For a follower of the path of Truth, it is worse than sin to disdain or look down upon anyone. 12. Those who are true Lovers of God give away both of the worlds for the sake of their Beloved and even then feel that they have done nothing worthy. Boigraphy - Hayat e Khwaja Moinuddin Chisti Hasan Ajmeri Rehmatullah Alaih wa Safar e Hind.